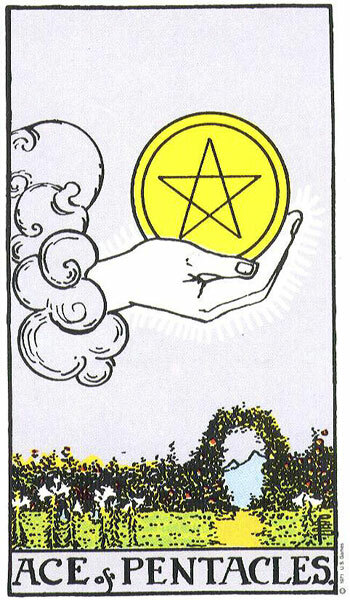 This Ace of Pentacles shows in an almost silver sky, a hand emerges from a frothy cloud, holding a golden coin emblazoned with the pentacle. Beneath it is a flowering garden surrounded by a hedgerow with an open entrance leading out to a distant majestic landscape. The hand holding the coin is so white it is made of light. Is it the hand of an angel, the hand of a god perhaps? Rays of energy are pulsating out from the hand’s profile, signaling the power of this gift that the universe is offering. As much as the universe is offering you this gift of pragmatism and abundance, you must act to accept it. It offers to you, not dropped into your lap. With this Ace of Pentacles card, you are likely to be feeling energetic, optimistic, upbeat, and hopeful about your future. Things should be going well, in general. You could well be starting something new very soon, this could be in the realm of work or personally, but either way, it’s a good thing. 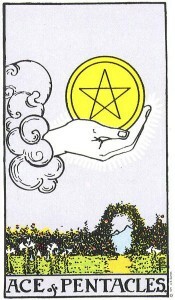 The Ace of Pentacles suggests that you may have a promotion or a new set of responsibilities. If you’re wondering whether or not to leave your current position, this card is an encouraging one to see. This new position may happen whether you are looking for it or not. Either way, this is good news. For those who have been struggling with finances the appearance of the Ace of Pentacles would highlight the end of such worries. This can mean securing a job, gaining promotion or even just finally paying off a loan. If you are currently in a committed relationship, it may well rise to new and better heights soon. You will re-connect. If you’re looking for love, this is a very positive time to get out and meet people, something new could start that is very promising in terms of love. Be prepared. Think positively. Have fun. Money, Investments, Abundance, Prosperity, Health, New Business, New Job, Financial Stability.